Happy Expressions: JJ Happy birthday! 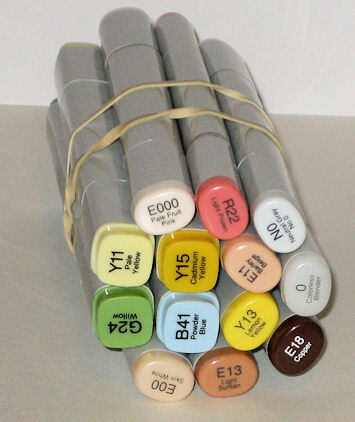 The sponsor this week at Jacksons Digital Expressions is Bugaboo Stamps. I choose to use JJ Kick Up Your Heels and Have a Happy Birthday! Yes, its another JJ image. You will see more of her. 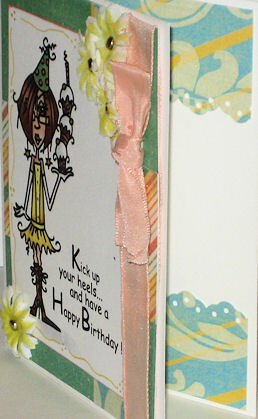 [smile] The card base is white and the DSP is from the DCWV Sherbert stack. I colored her with copics and used a peach ribbon that I had in my stash. I doodled around the image with sukura orange glitter pen. The flowers again were from my stash and colored with copics Y 13. I will add this card into these challenges. 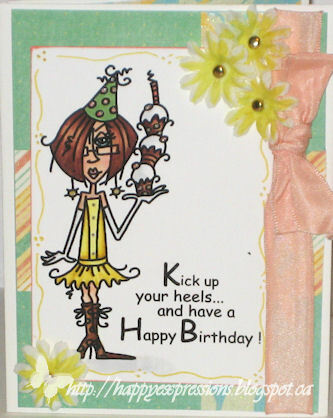 Stamps - Bugaboo JJ kick up your heels and have a happy birthday! Such a fun birthday card. Thanks for sharing it with us for the anything goes challenge at Paper Makeup Stamps' Digi Makeover Challenge this week. what a great image, love it!!! thanks for joining kaboodle doodle!!! Someone's birthday will get even better when they receive this card! The coloring looks wonderful and I love the pink bow! Wonderful and fun birthday card. Love the green and peach together. Thanks for joining our challenge at Digi Makeover.